Thus, I am pretty sure that many of these are esoteric lessons which can only be learned through practice. Still, I am going to make an effort to set them down (going from simplest to most complicated). Length – I tend to write using a loose three-act structure. And, over the course of several novels, I’ve found that the rough proportion between acts tends to be 2:3:1. That is, the second act is 50% longer than the first and the third act is half as long as the first. When I get to the inciting event (the point at which hell breaks loose and the story really gets going), I multiply my current word count by 6 to get a rough estimate of how long the novel will be. Create distance between the beginning of an element and the point when it comes to fruition – When I find myself beginning a chapter with something like, “I’d asked Alma to tell me something about the history of the serial killer, and when she finally got back to me, she sat me down and said…” I’ll delete the first part and then actually go back to a previous chapter and put in a reference to this request to Alma. In a novel, you’ve got so much space, it makes sense to play with it. Otherwise, you’re introducing a nonlinearity to the telling of the novel that is not organic, it’s just a byproduct of the fact that you’re making it up as you go along. The events of the novel should matter to the main character – You can write a shockingly large amount of a novel without ever realizing that your character doesn’t care about any of it. This usually means you’re concocting very thin reasons for your character to do what you want. For instance, if you write a story about an alien invasion and make your character violently allergic to the aliens, then you’ve got a good pretext for him to go around blasting aliens, but it still has a thinness to it. The reader can tell that you’re basically maneuvering the character into doing what you want, rather than creating someone who’s rich enough to have desires of his own. The more complicated your novel’s setup, the easier it is to lose sight of the character’s motivations. For instance, if you’ve got a world that’s entirely composed of an MC Escher-like tableau of moving escalators, and your character is desperately racing downwards, against the tide, trying to reach the bottom, then you can spend lots of time thinking about the characters they meet on the way, and the obstacles they encounter, and the person they push off the escalator, and the time they get put on trial for queue-jumping…without ever considering why they really want to get to the bottom of the escalator and if that reason can sustain an entire novel. If I’m having trouble writing it, then it probably shouldn’t be written – This might apply only to me. But I find that if I’m not really able to write a scene, then that’s because I can sense, on some intuitive level, that it doesn’t belong in the book. The character’s internal struggle should resonate strongly with the novel’s setup – For instance, in my escalator-world story, I might say that the escalator-world protagonist wanted to reach the bottom of the escalator because there was an ancient prophecy that at the bottom lay the control room and that the person who reached the control room would control the whole escalator-world. But this would actually be a pretty bad conflict, because it has nothing to do with escalator or mechanization or racing against the tide or feeling like the whole world is against you. I don’t exactly know what would be the right internal conflict for escalator-world, because it’s actually very hard to figure this stuff out. The bulk of my angst in novel-writing comes from matching up these pieces in the right manner. If something isn’t really making sense, the solution isn’t to explain it or justify it…the solution is to change it – If you find yourself writing in all kinds of explanatory material about how none of the escalators have ever broken before, because, until recently, there was a race of mechanic-robots that serviced the escalators, but the robots disappeared and now the escalators are breaking, then you might be trying to paper over a basic weakness in your concept. Oftentimes, I find that the solution is to just change your concept to something simpler. For instance, instead of a world of escalators, maybe our entire world is now a giant river, which is ceaselessly flowing in one direction, and it takes an immense amount of strength to go upriver. Rivers can’t break down, so an essential problem is eliminated. I know the novel is coming together when everything starts to become very specific – Lack of specificity is, to me, often an indicator that I’m trying to avoid really thinking about what’s going on. For instance, it would be very possible for me to say that the protagonist of my escalator-world novel is disgusted by the escalator-society’s insistence on always rising higher and higher and wants to retreat downwards into what he hopes will be a simpler world. If I wrote a novel with that non-specific conception of things, I’d probably include a lot of generalized grumbling on his part about other peoples’ pushiness. But there’s a certain fuzziness about this. In what way does escalator-society insist on always moving higher? How does this insistence negatively affect him? What exactly does he hope to find down below? 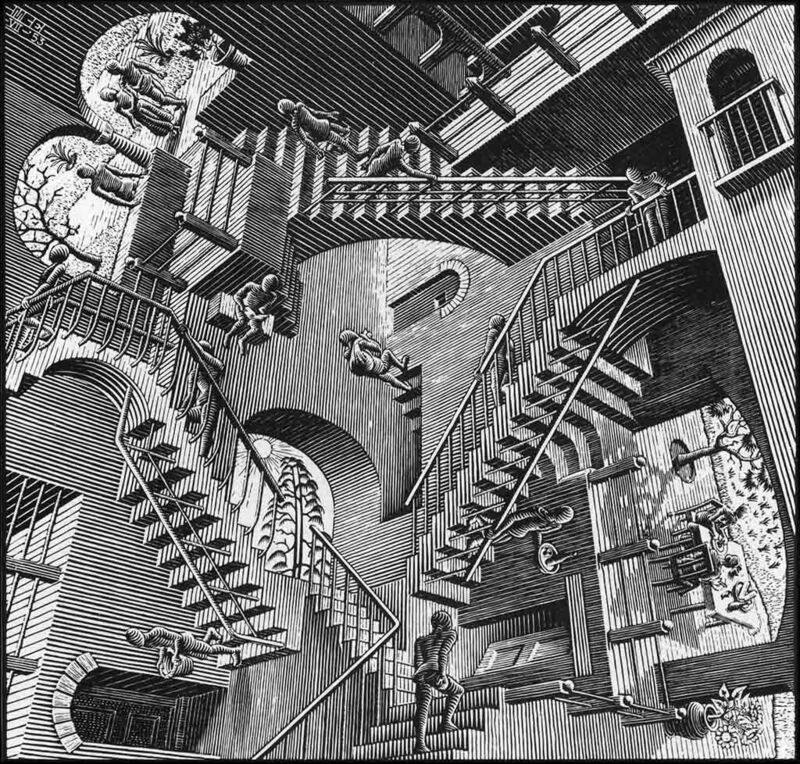 So maybe I think a bit harder about things and I realize that escalator-world is divided between two ideologies: standers (who stand on the escalator and wait for it to carry them up) and climbers (who believe in adding their own footpower to the escalator’s velocity). In the protagonists’ part of escalator-world, climbers are predominant. But he remembers, wistfully, all the standers who he shouldered past on his way up. Now he’s running back down in order to see what happened to them: he’s dreaming of finding a part of escalator-world where everybody is just standing there and enjoying life. There. You see how that’s more specific? Now he has something specific to look for, and all the conflicts are thrown into much sharper relief. The main character should have something to do – It’s possible to create a very specific, well-thought-out novel where the internal and external arcs fit perfectly…but in which there’s not really anything for the character to do, other than see what happens. For instance, suppose my escalator-world story was about all these people who’d lived their whole lives on the escalator, but who have suddenly determined (through science!) that the escalators are speeding up, and that each subsequent escalator is going faster and faster and that soon they will reach some kind of physical limit. This is (relatively) cool and has some internal conflict (people are afraid of change, they’re worried about the future, they wonder if they’ll see the end before they die) and some external arc (the increasing speed of the escalator will result in all kinds of strange physical effects–particularly to do with wind resistance, etc–that might result in greater tension). At the same time, there’s nothing for the protagonist of this story to do, other than talk to people and think about stuff. And that’s alright, I guess, but it means that the novel will have no guiding principle that will suggest what things should be included and what things should be cut. Since there’s no real plot to move along, then the only criteria for whether or not to include scenes is how well they develop the character and/or illustrate the story’s themes. And that sort of story requires a very sure hand. I mean, it can be done (for instance, there is really nothing for Gregor Samsa to do in Kafka’s Metamorphosis), but I, personally, find it very difficult. Dude, I really liked this elevator world concept. Although I haven’t written a novel before, I do find myself writing little stories sometimes, and they often end up with a core conflict I’m trying to work through–but without any particular action. Maybe this is the difference between writing to work through your thoughts and writing for publication, but do you ever struggle going in the opposite direction–from a core theme to what scenes are needed to bring it into narrative relief? Yes, Scrivener makes it easy to overwrite things, and I have found myself scrambling to find an archived version that contains that particular line that I wanted. But, sometimes, after much searching, I’ve found the line and discovered that it was nothing special, so in some cases it’s just about idealizing what’s not in front of me.